The Printronix P8205 has a print speed of up to 500 lpm. It's the most reliable matrix line printers available. Built into a sound-suppressed (50 dBA) quiet cabinet style for high speed and quiet operations, this printer is one of the most popular models for those companies needing high volumes of printing. Click here or on the image at right for specifications. When the P8205 looks ahead and senses a lot of space with no print required, it leaps to the next line to print. This ability to jump is called paper feed or "slew", and the paper goes by at up to 12 inches per second! If the customer output has few lines of print, it jumps ahead and can significantly shorten the printing time. The Printronix P8205 Quiet Cabinet models are well-suited for normal office operations�and in noise-adverse areas. � The�P8205 provides the operator with�a�wide choice in paper handling options. Please click here to be taken to the P8005 Open Pedestal page. 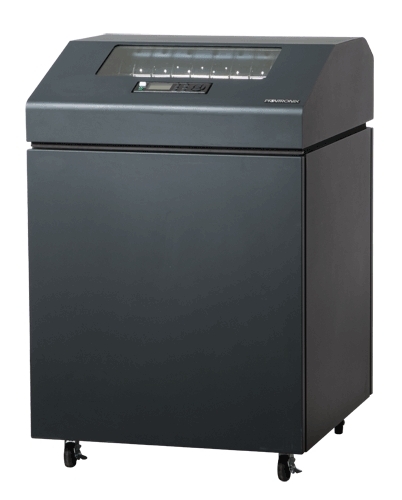 If you need quick access to forms, the P8005 Open Pedestal model is ideal for busy warehouse and manufacturing floor areas, and when media changing and grab-and-go is at a high volume pace. Plain and simple.... the job of the P8205 printer is to produce high volumes of printed output on a very reliable basis. When your�company relies on printed output to operate, having a maintenance plan in place that matches the mission-critical nature of the printer is number 1.